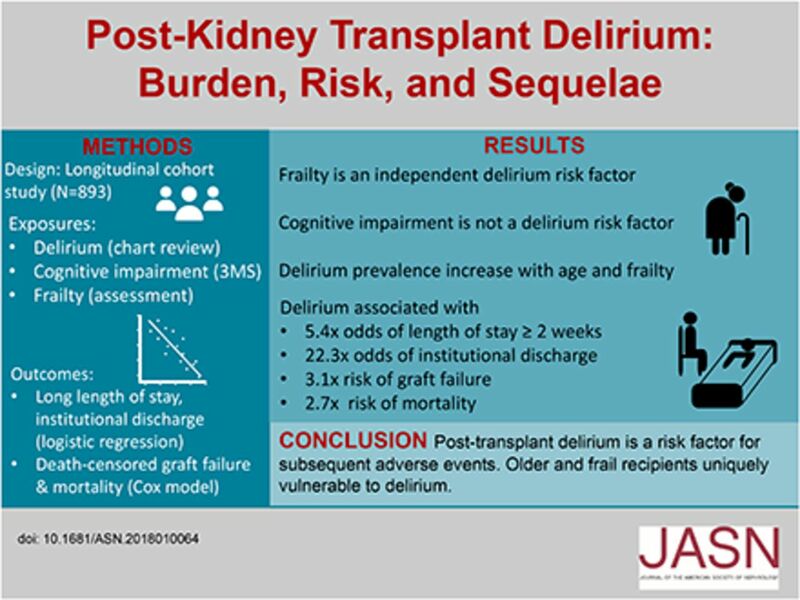 Background Frail kidney transplant (KT) recipients may be particularly vulnerable to surgical stressors, resulting in delirium and subsequent adverse outcomes. We sought to identify the incidence, risk factors, and sequelae of post-KT delirium. Methods We studied 125,304 adult KT recipients (1999–2014) to estimate delirium incidence in national registry claims. Additionally, we used a validated chart abstraction algorithm to identify post-KT delirium in 893 adult recipients (2009–2017) from a cohort study of frailty. Delirium sequelae were identified using adjusted logistic regression (length of stay ≥2 weeks and institutional discharge [skilled nursing or rehabilitation facility]) and adjusted Cox regression (death-censored graft loss and mortality). Results Only 0.8% of KT recipients had a delirium claim. In the cohort study, delirium incidence increased with age (18–49 years old: 2.0%; 50–64 years old: 4.6%; 65–75 years old: 9.2%; and ≥75 years old: 13.8%) and frailty (9.0% versus 3.9%); 20.0% of frail recipients aged ≥75 years old experienced delirium. Frailty was independently associated with delirium (odds ratio [OR], 2.05; 95% confidence interval [95% CI], 1.02 to 4.13; P=0.04), but premorbid global cognitive function was not. Recipients with delirium had increased risks of ≥2-week length of stay (OR, 5.42; 95% CI, 2.76 to 10.66; P<0.001), institutional discharge (OR, 22.41; 95% CI, 7.85 to 63.98; P<0.001), graft loss (hazard ratio [HR], 2.73; 95% CI, 1.14 to 6.53; P=0.03), and mortality (HR, 3.12; 95% CI, 1.76 to 5.54; P<0.001). Conclusions Post-KT delirium is a strong risk factor for subsequent adverse outcomes, yet it is a clinical entity that is often missed.